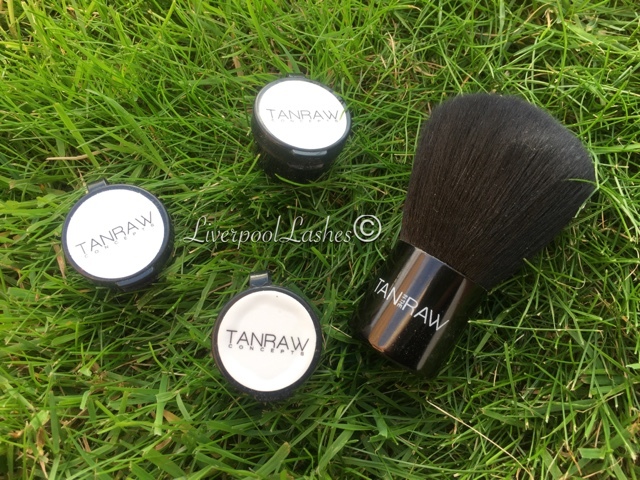 I was contacted by the UK Distributor for Tan In The Raw to trial the product and see what I thought. As always I always make it clear that my thoughts are completely honest but I was keen to try the concept. Tan In The Raw is a patented odour neutralising drying powder that you apply after a spray tan or any form of product that contains DHA. I liked the idea of this because it's a multi tasker, not only is it helping to dry the skin so that you can get dressed a little quicker but it takes away the scent that many people dislike, sometimes to the point were as they may avoid false tans completely. I must admit I have always been happy with the scent of my spray tan brand until more recently when I felt like it was definitely leaving a trace of the typical DHA odour the following day, even after washing off the guide colour. Of course, everyone's skin reacts differently but it was definitely something that had bothered me. 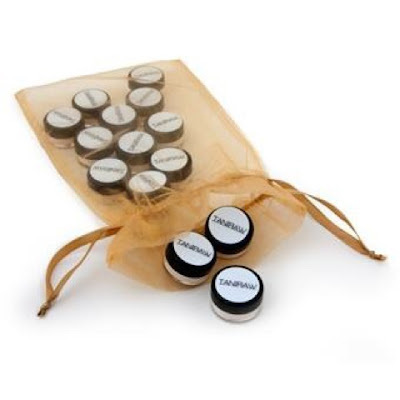 I was sent three of the sample pots along with the kabuki brush which would be ideal to retail to clients as an add on service. For the clients that like an all year around tan, they could purchase the large pots. The powder itself is really finely milled with a slight golden tone to it with shimmer. I would say the fragrance of it is pretty close to a caramel style scent. The instructions were extremely straight forward, you are to sprinkle the dust over the skin after applying your tanning product. I wasn't sure how soon I was able to do this so to properly trial it, I just applied it immediately afterwards. I felt like it really did remove any sticky areas and make my skin instantly dry to touch. In terms of the scent on my skin, I would say that it definitely masked the typical DHA fragrance although I could smell it faintly which I think is to be expected. I continued to smell my skin every few hours if this changed but it didn't, in fact I was surprised how long the caramel fragrance actually lasted considering I had only swept the kabuki brush across my skin. I wanted to also point out, just incase you were wondering as I didn't wait at all for my tan to dry, that it didn't effect the quality of my tan at all. The golden flecks in the powder were really pretty, although I do see this as a added bonus that they are there. To me they just add a finishing touch to my newly golden brown skin. I would even use this powder in the summer to highlight collarbones etc on it's own! In terms of price, of course I cannot reveal trade prices online so you would need to contact Philippa, the distributor here. She is also on Twitter and can answer any further questions. The recommended retail price for the small pots are £3, the Kabuki Brush is £8 and the large pots are £24.99. Point of sales are available at £40 including leaflets and 20 individual applications. My overall thoughts are that this product is perfect for those who are looking to have a beautiful tan but want to minimise the lingering odour. It would be a good add on product for the client to apply themselves before they get dressed. Of course the therapist could apply it at the end of the service but you would need to fully cleanse the kabuki brush between each client. I can imagine it would be handy to have in a therapist's kit for when a group booking is made for spray tans as it would speed up the drying process. I hope you've found this review helpful and something to think about. I must admit I was pretty excited to try Tan In The Raw as I haven't heard of any other products like it. Don't forget to follow my Facebook page to keep up to date with my latest blog posts, nail tutorials and updates.